Are you a fisherman? 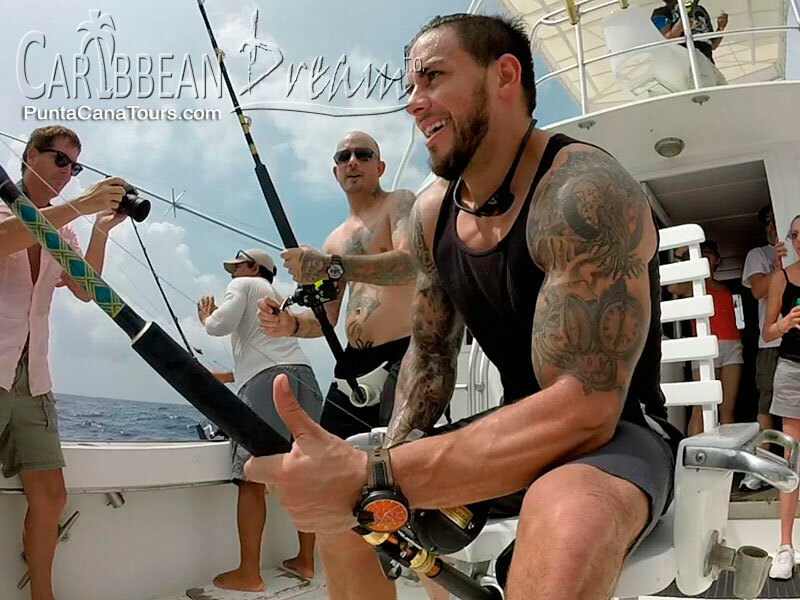 Or someone who simply wants to hit the Caribbean seas for the chance to catch the big one? 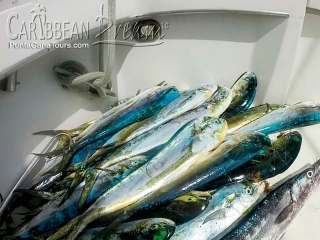 If so, look no further than Caribbean Dream's Fishing Excursion! Year round, there's prized game fish to reel in...This is what YOU can land! Mahi Mahi - Known locally as Dorado, this tropical fish is recognized world wide for its meat. At up to 7 feet and over 80 pounds, you're gonna have to work for the chance to taste! 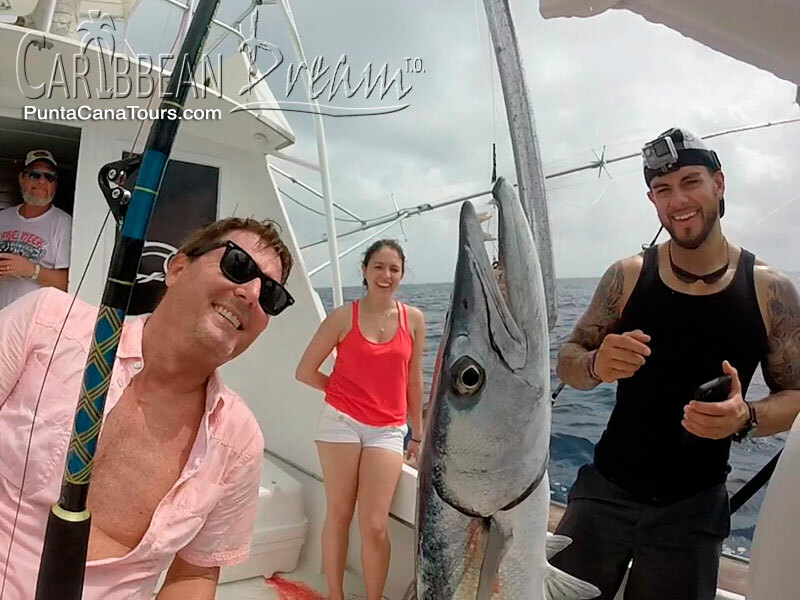 Wahoo - Living in Tropical seas and part of the mackerel family, Wahoos are long, sleek fish with average weights of 20-40 pounds. 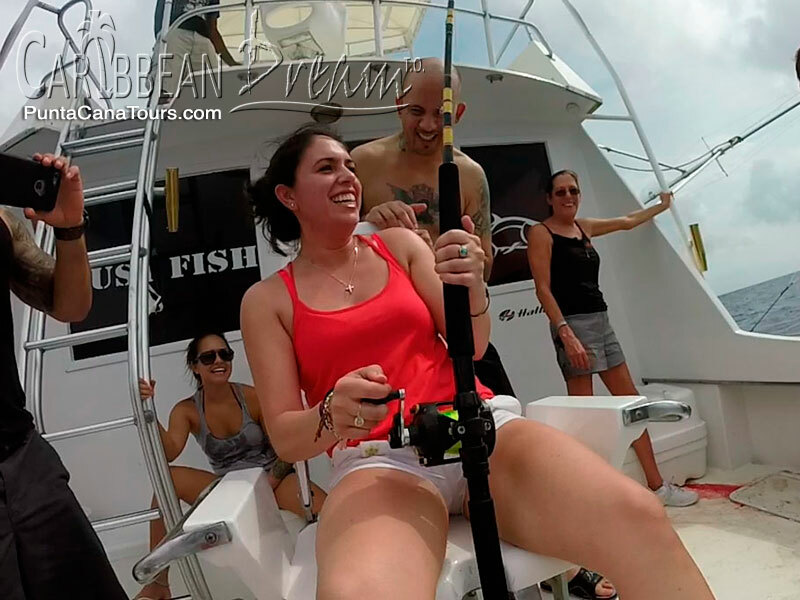 Fun to catch and even better to eat! 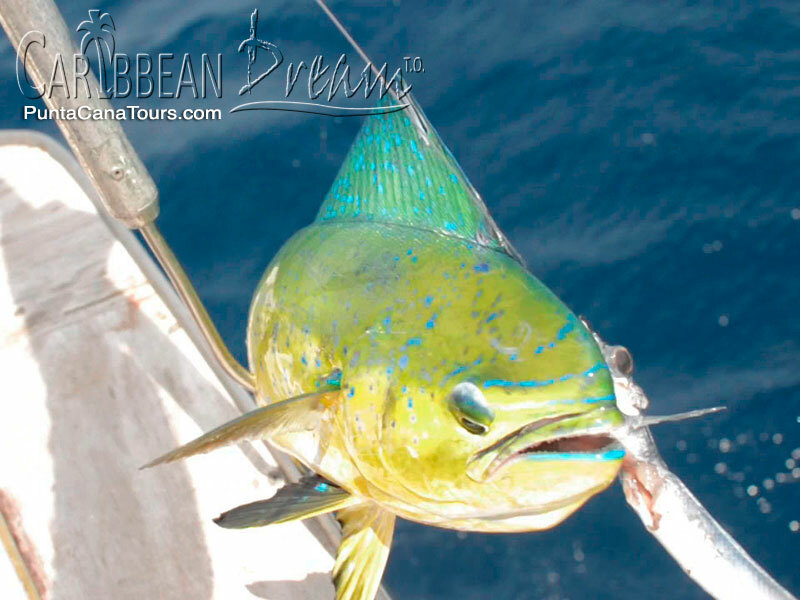 Yellow Fin Tuna - A common fish in temperate latitudes, you can possibly land one at over 7 feet and over 400 pounds! Delicious meat often used in Sushi. 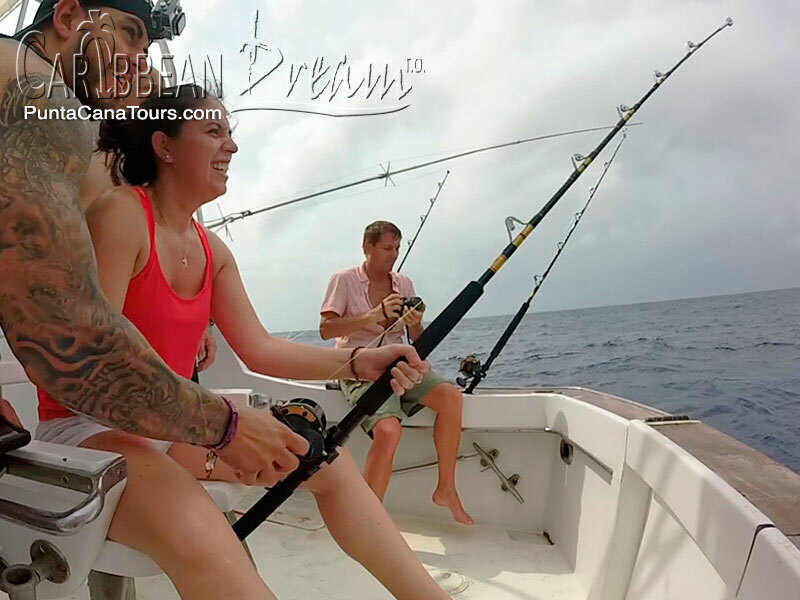 Sailfish - The fastest fish on earth is caught regularly in Punta Cana. Size can be over 6 feet and over 200 pounds. Fast and big! White Marlin - Smaller than their relative, white marlin can measure up to 10 feet and well over 150 pounds. Not small! But the meat is incredibly tasty. 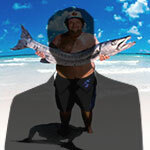 Barracuda - A formidable looking fish up to 6 feet in length and up to 100 pounds. 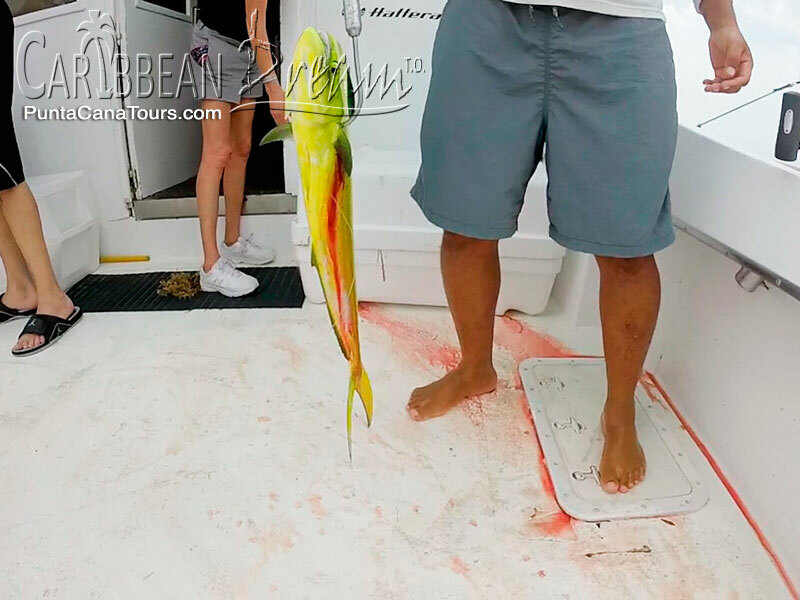 Great meat and a fun catch. 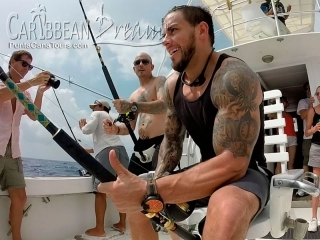 Blue Marlin - The grand prize! Weighing over 1,000 pounds and up to 16 feet in length, the blue marlin is considered a delicacy. There's even observer rates if your friends and family simply want to watch the show! But whether you're fishing or watching, everyone gets to enjoy their time out on Punta Cana's beautiful deep seas with refreshments like Rum, Coke, Water, Sandwiches and Fruit. There's only so much space in the boat so scroll down and Book Now. 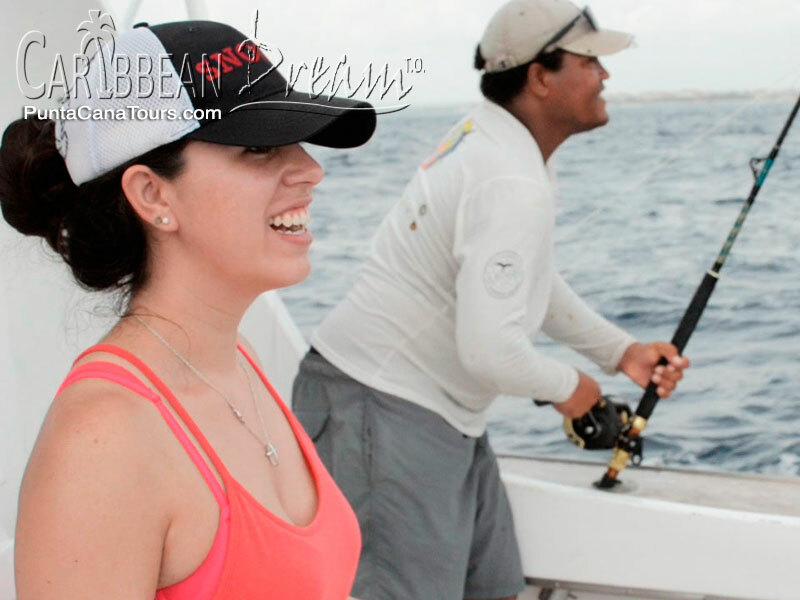 Come enjoy one of life's greatest pleasures in Punta Cana, Dominican Republic: Fishing! 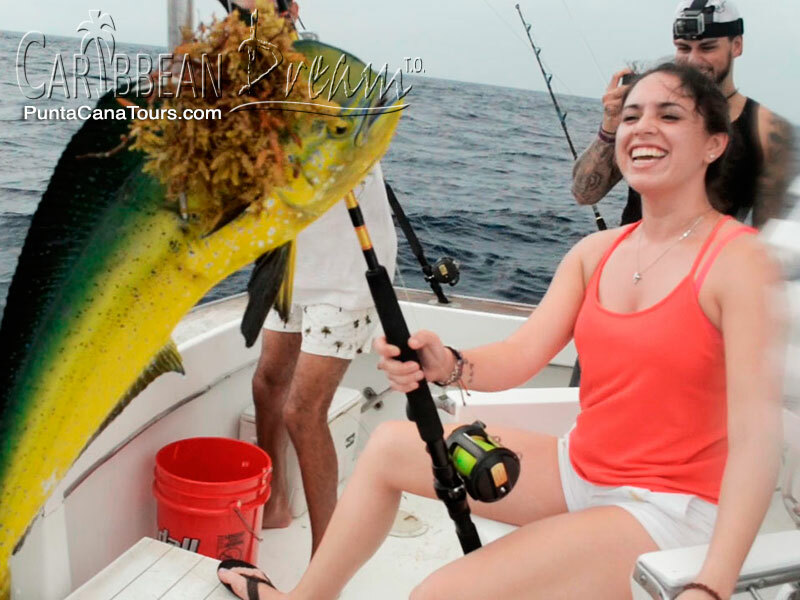 And let our experienced crew assist you in landing the big one! 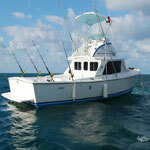 Our boat can accommodate a total of 7 fisherman and 3 observers. Please note that in deep sea fishing the rods are placed in a holder. 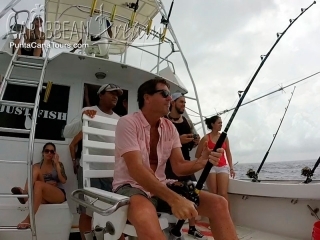 The rods are then grasped when there is a bite. The type of fishing done on this excursion is trolling. Trolling is a method of fishing where several baited lines are drawn through the water. In other words, the boat is constantly in motion. Because of this we highly recommend Dramamine for motion sickness. 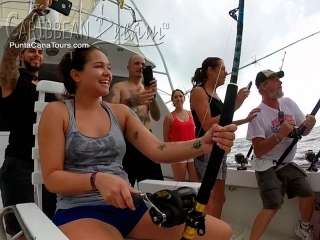 The price is for renting the boat for a Half Day, not price per person. You may have anywhere from 1-10 people total on the boat. This price is for renting the fishing boat for a FULL Day. It is not price per person. You can have from 1-10 people total on this boat. thank you and your staff for the excellent service!